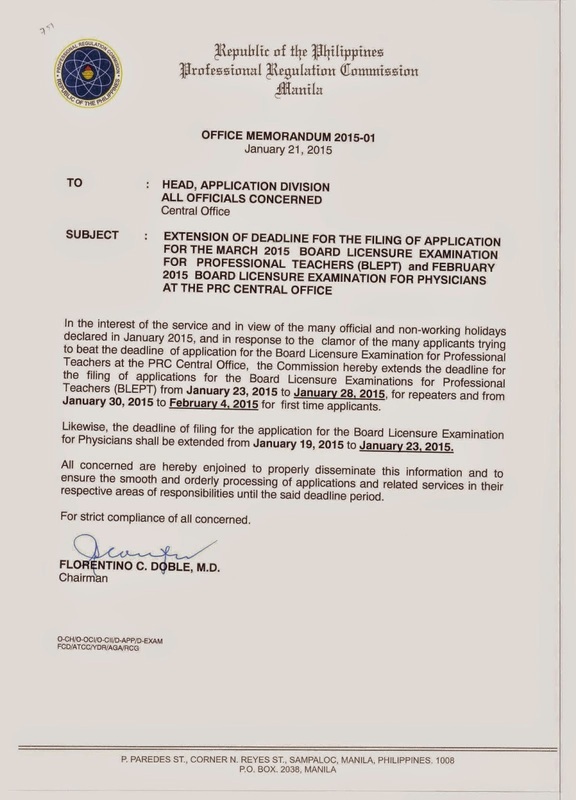 MANILA, Philippines - The Professional Regulation Commission (PRC) announced on Thursday the extension of deadline for the filing of application for March 2015 Licensure Exam for Teachers (LET) at the PRC Central Office. In the memorandum 2015-01 signed by PRC Chairman Florentino C. Doble on January 21, 2015, the commission extends deadline of filing for LET from January 23, 2015 to January 28, 2015, for repeaters and from January 30, 2015 to February 4, 2015 for first time applicants. PRC said that the extension was due to the interest of the public as many official and non-working holidays were declared in January 2015 (i.e. holidays during the Pope Francis visit) and in response to the clamor of the applicants trying to beat the deadline of filing. The first LET this year will be conducted on Sunday, March 29 in Manila, Zamboanga and other regional offices. PRC target release date of LET results is on May 15 or after 47 calendar days. TheSummitExpress in partnership with PRCBoardNews.com will deliver on-time and important updates and results for the 2015 LET.